Four clear glass block recolors of Numenor's WallWindows. Thanks to Numenor and to Lollipop69 who let me use the clear glass block texture from her Glass Block Wallpapers for this project. If you enjoy glass blocks, Lollipop69 has many more glass block wallpapers at Insim. The glass block textures work well with the the basic WallWindow set, WallWindow_Seamless_BASIC_set_UPD-15jan06.zip and the curved set, WallWindow_Seamless_CURVED_set.zip. 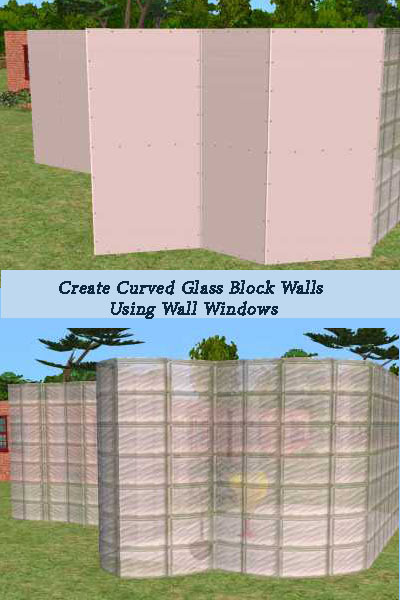 The glass block pattern may not be as recognizable with some of the other forms of WallWindow. 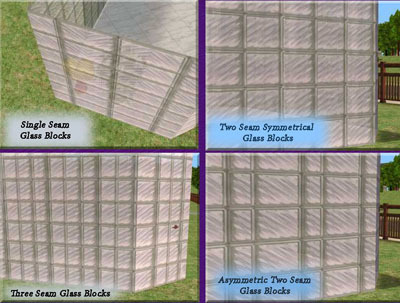 The glass block recolors come in four variations on the number of blocks in each wall panel. The Single Seam has one vertical seam with 1/2 blocks on both sides of the seam. The Two Seam (symmetric) has two and 1/2 block columns of equal width while the Asymmetric Two Seam has the same number in different widths. The Three Seam set has three and 1/2 columns of same width blocks. The recolors can be mixed to give you different patterns of blocks. The inside and outside of the recolors are mirror images; they can be reversed which further increases the number of pattern possibilities. How to use: Unzip the WallWindow sets and put them in your downloads folder along with the glass block recolors. 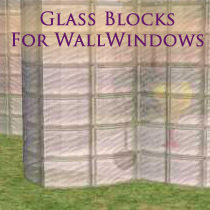 The WallWindows appear in the game as Build Mode custom content in the door, window and arch sections. If you download the other types, they will appear in the usual section for that type of structure. Create a bare wall then add the WallWindow window or door to the wall; they behave like windows and doors though they look like walls. All WallWindow recolors work with all forms of WallWindow. The documentation in WallWindow documentation_(PDF).zip or WallWindow_documentation_(RTF).zip has further illustrations of how to use the many wonderful varieties of WallWindows. Term of Use: These recolors may be used in lots posted to any free site EXCEPT for the EXCHANGE. Do not include Numenor's WallWindow meshes in ANY upload. Please link back to MTS2 so downloaders can locate the Wall Window meshes. Credit Numenor and myself for the WallWindow Glass Block recolors. These are Numenor's requirements, please follow them. These recolours may or may not be endorsed by kaneonapua.